To say my son is not a big fan of reading may be an understatement. How frustrating! Didn’t he know I had big plans for the type of reader he would be? You know, the read-by-age-four-voracious-can’t put-the-book-down type of reader. I’m a reading teacher after all! Couldn’t I just mold him into the type of read I wanted him to be? Ha! I couldn’t convince him to enjoy reading anymore than I could convince him that peas were his favorite food. I could try. I could coerce. Prod. Reward. Punish. But I could not make him enjoy the act of reading. Enjoyment comes from within, and reading a book just isn’t his thing. So, I was faced with a choice—force reading and torture us both, throw my hands up and surrender, or read aloud. The only clear choice—to save my relationship with my son and my sanity—was to read aloud. So that’s what we did. And what I learned along the way was beautiful. Settling in on the couch with a mug of tea in one hand, a book in the other, my kids plop down around the living room. Some encircle the bin of LEGO bricks. Another sprawls, all arms and legs, into the armchair beside the window. Still another climbs into my lap and pulls her blanket up to her chin. They can’t wait to hear the next chapter in Carry On, Mr. Bowditch. Here we are, all six kids and me, gathered round a book. They giggle at my attempts to pronounce some of the ship terms, and beg me to read another chapter when I close the book. These mornings are building connection—connection between us, building our family tapestry of memories, and connection between each of my kids and the love of story. Notice that he is not saying reading transported her, but books. The stories in the books transported her, not the act of decoding words. 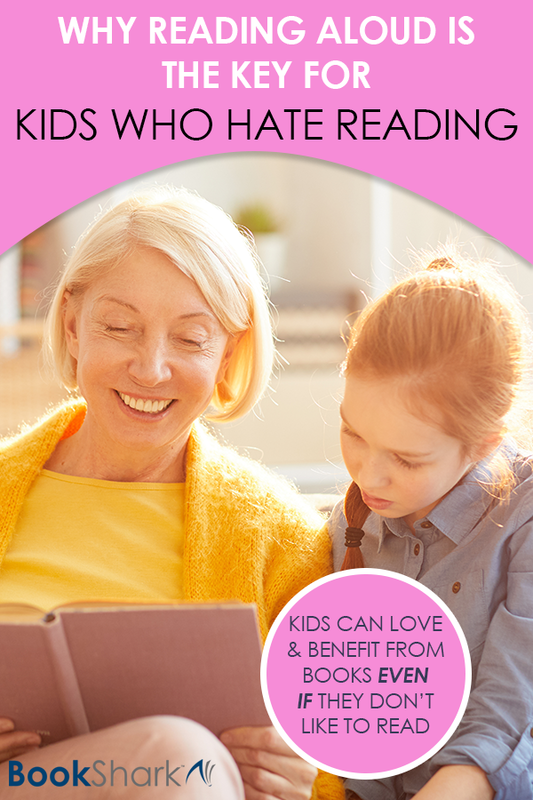 This distinction may seem like splitting hairs, but for kids who don’t like to read, it is a vast canyon. The act of reading can be cumbersome and get in the way of the enjoyment of the story. Listening to a story read aloud can bring the story to life and create connections that silent reading cannot. 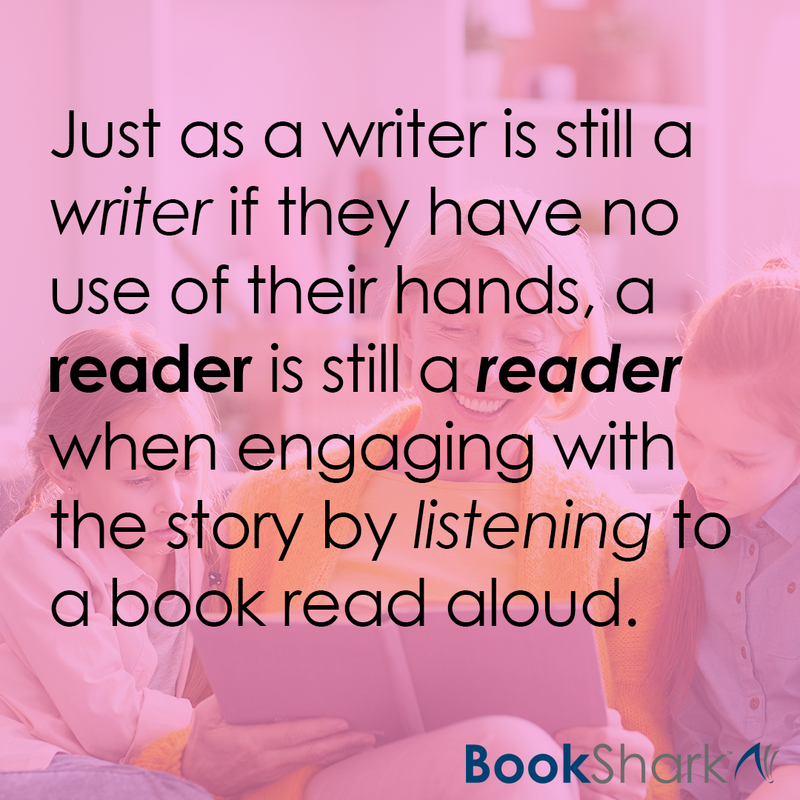 Just as a writer is still a writer if they have no use of their hands, a reader is still a reader when engaging with the story by listening. Writers connect with the world by sharing their ideas. Readers connect with the story by allowing themselves to connect with the characters and the plot. We all want our children to build their language skills—vocabulary, comprehension, critical thinking, and discussion. Reading aloud with a book-based curriculum does all of this! When reading at their own level, children are exposed to a limited scope of words, as dictated by that reading level. 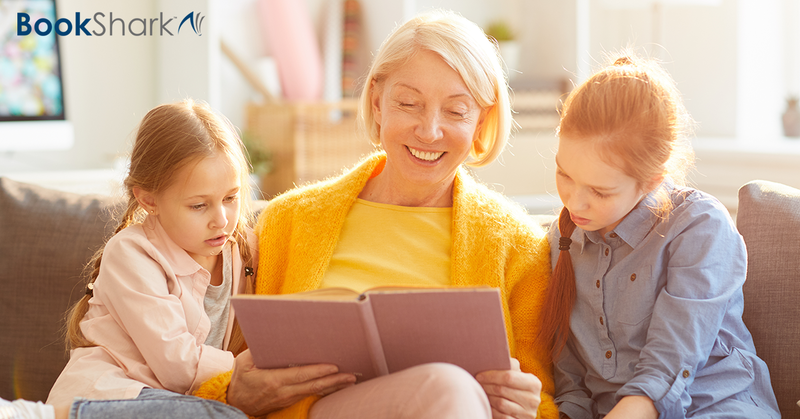 When listening to a read aloud, children (teens and adults, too) have the opportunity to expand their vocabularies in new ways. They hear new words in context, making their meanings purposeful within the story rather than just words to be memorized on a vocabulary worksheet. With read alouds, children feel more comfortable to stop and ask, “What does that mean?” When reading silently, the child is more likely just to skip over the word and hope for the best. The same principle holds true for comprehension. When the act of decoding words is taken out of the reading equation, children are able to comprehend more sophisticated stories and sentence structures. Both of these lay the path for critical thinking and discussion. When we read aloud with our kids, we experience history with them! We are there as they wrestle with big ideas. They see our facial expressions as we read a poignant paragraph, and hear our inflection as we move between lines of dialogue. From these shared experiences come discussion. When reading aloud, we have the opportunity to pause and chat about the characters’ actions, the author’s word choice, and the surprising plot twist. We are there—building language skills with our kids in a most natural and enjoyable way! Reading Aloud—What If I’m Too Tired or Don’t Like to Read Aloud? I get it! Sometimes sitting down to read aloud makes me yawn. I’m tired from a busy week or just plain tired of reading aloud. My voice needs a break. The solution is audiobooks! We love, love, love audiobooks! They have kept our read alouds flowing through illness and busy seasons when we’re on the run. We listen along on our drive to swim practice or on a quiet Monday morning when we all need extra time to wake up. I especially like to select read alouds that capture the essence of a historical time period through the added effects of the audiobook. The Lion, the Witch, and the Wardrobe wouldn’t sound the same if not read with a British accent. The lilting harmonica notes in Echo draw us deeper into the story, and Bud, Not Buddy deserves the deep, smooth voice of James Avery. Without the subtle nuances added to these audiobooks, our experience of them would have been very different. Reading Aloud—What About the Teen Years? Just because there are thirteen candles lit on the birthday cake doesn’t mean that your read aloud days are done. The opposite is true! Reading aloud with a teen is an adventure worth taking! The stories that they choose are meatier and almost always beg for discussion—especially when the subject matter tackles sensitive issues. Read alouds in the teen years keep learning alive when textbooks often become the norm, and the connections we made through books in the earlier years can continue to thrive. A book-based curriculum is perfect for kids who don’t like to read and for those who do. Human beings thrive on story, and a book-based curriculum is built on just that—story! A book-based curriculum is like a well-crafted booklist, laid out like a feast, and reading aloud brings that feast to everyone. Enjoy! 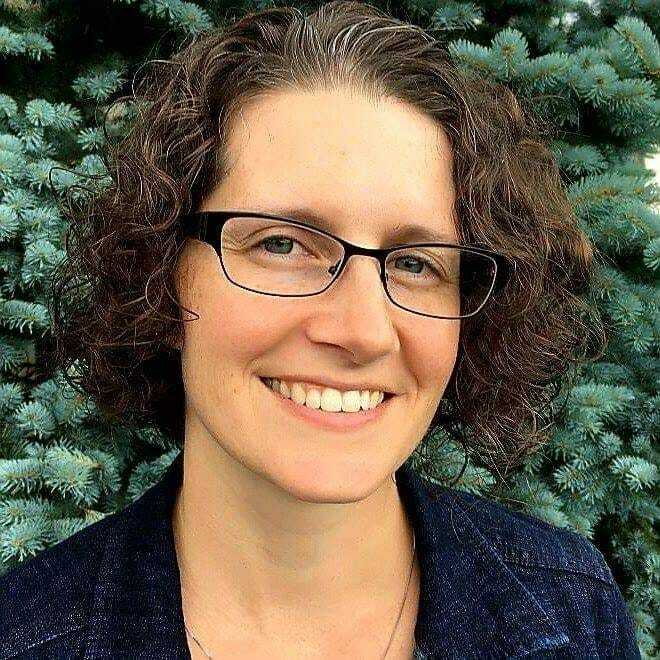 Angela Awald is a homeschooling mama to 6, certified teacher, writer, and doula. Her days brim full of learning, loving, and laundry (lots and lots of laundry)!! She believes that nurturing children (and ourselves) means helping them to see that all of life is about learning – from our mistakes, from each other, and from great books! Angela blogs at nurturedroots.net where she shares the ways she is nurturing her family and inspiration for nurturing your own.